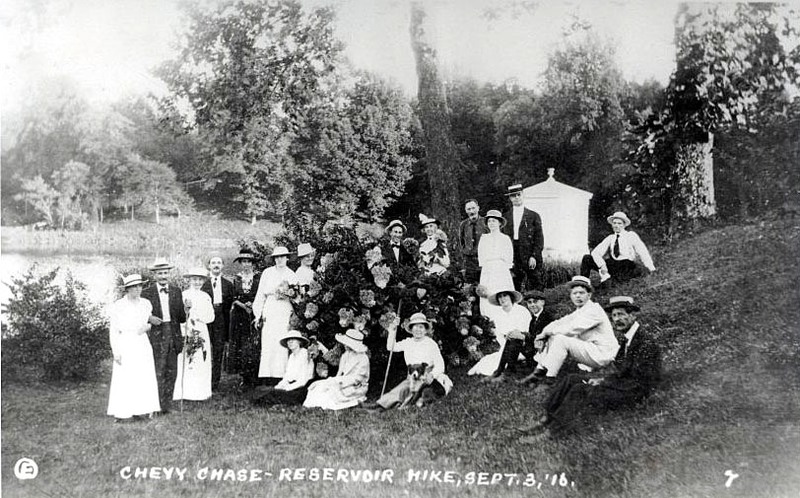 A hiking group posing for a photograph at Chevy Chase Lake, and reproduced as a postcard with these words: "Chevy Chase - Reservoir Hike, Sept. 3, '16." Postcard image donated by Harold V. Silver, and used with his permission. CCHS 2008.257.01. From 1894 through the 1920s, Chevy Chase Lake offered its patrons a variety of amusements, including boating, bowling, a shooting gallery, boat swings, a merry-go-round, and pony rides. In addition to these activities and games, there were facilities for picnics. A pathway around the lake provided the opportunity for a stroll. There were also “rustic benches” – 5,000 at one point, placed around the park. Some were at the bandstand, others at the “rustic” outdoor movie theater. Although concerts and dancing were always featured at Chevy Chase Lake, in the 1890s, special visual displays, on both land and water, as well as spectacular acts by tightrope walkers, gymnasts and contortionists, and high divers, were advertised as special attractions. There were several different managers of Chevy Chase Park over the years, and each set his own tone as they improved the facilities and hired entertainment. In the early years, the amusements were family-oriented, with something of interest for visitors of all ages. When Herbert Claude signed a lease with the Land Company to manage the amusement park, he introduced the pony rides and the merry-go-round. In 1917 or 1918, Meyer Davis, the dance band impresario, and others formed a company and took over the management of Chevy Chase Lake. J.W. Wood managed the park for Meyer Davis, and the entertainment focused on big bands, dancing, and vaudeville acts. Davis was a fan of ten-pin bowling, so the bowling alleys remained. Although children must have still enjoyed a visit to Chevy Chase Lake, the main entertainment was for adults. In 1932, Eddie Carr booked all the musical entertainment, and in 1933 he was joined by Al Stern. In 1934, new managers took over, following roughly the same formula: big bands and dance music, bowling, and a café – though after the repeal of Prohibition in 1933, the café began serving alcohol. For a timeline of all the amusements at Chevy Chase Lake, click on this link to open a PDF chart: Music and Amusements at Chevy Chase Lake, 1894-1936. In the late 1890s, Chevy Chase Lake used a number of “special attractions” to promote the amusement park and draw patrons out to the suburbs. One of the most popular decorative elements, frequently mentioned in newspaper advertisements and publicity, were the so-called “Fairy Lights.” Color lights were strung around the lake and in the trees -- and sometimes on the water, as well. The “Wooded Island,” a special display modeled after a section of the 1893 Chicago World’s Fair, was created at the lake using the “fairy lights” and other props or staging, often called “set pieces.” In addition, for the special 4th of July celebrations in 1900, a “Naval Battle” was staged each evening on the lake, complete with submarines and explosions. Click to the next page to learn more about these spectacular attractions.